I try not to get too distracted by the ways that The Twilight Zone is different from how a show of its ilk might be produced today. After all, a substantial part of its power stems from the fact that it’s from a different time and seems animated by vastly different concerns than the ones that animate modern dramas. Indeed, its occasionally stagey production can often make it seem more alien, rather than less, making it the rare TV show that actually benefits from outmoded production techniques, rather than seeming like it’s too pinned down by its era. But when watching “The Four Of Us Are Dying,” I couldn’t help but think of how the episode—which starts out pretty well but eventually unravels—might have been better if it were produced today and had a little more room to spread its wings (over, say, an hour-long episode). Imagine it this way: A woman performing at a jazz club is astounded when, on her break, her dead lover, a musician she once performed with, appears, very much alive, and asks her to run off with him. On the same night, a mob boss is confronted by someone purporting to be the ghost of a man he shot thrice in the gut and tossed into the river to die. The ghost makes off with the money he was shot over and barely escapes the mobster’s goons. And then a father, ever-tormented by the fact that his ne’er-do-well son has become a somewhat successful boxer and stares down at him from posters everywhere, chances upon that son on the street and takes it upon himself to let the son know just how much he’s disappointed his parents. All three of these little vignettes would seem basically disconnected but for taking place in the same city (and all involving someone long absent), and then the story could drop in the kicker somewhere at the top of act three: All three of these men are the same man, a man who can change his face to suit his purposes. That, honestly, feels slightly more like a Twilight Zone episode, and it backgrounds the worst single element of “The Four Of Us Are Dying,” which is that it more or less abandons some of its more intriguing elements for a very, very half-assed attempt at the story of a young man who’s disappointed his parents, to the point where his father decides to murder him. The script—by Rod Serling from a short story by George Clayton Johnson—foregrounds the fact that the man who will be carrying these assorted missions out is actually a shapeshifter, okay, a face-shifter, named Arch Hammer, a name delightful in how pulpy it is. But when we know going in that Arch is going to be assuming the identities of these various men, it robs the stories of some of their eeriness. 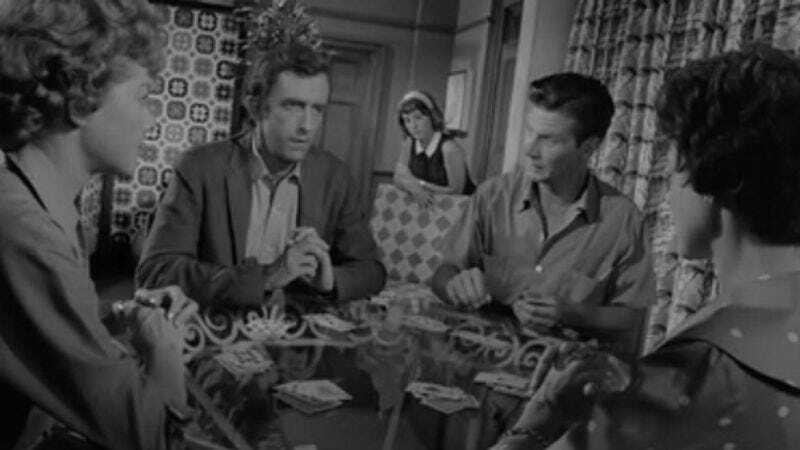 Worse, Serling tries to cram a lot of incident into the episode, and it ends up shortchanging just about everything. From there, the episode starts to fall apart. Arch-as-Foster convinces Maggie to meet him at the train station to skip town and run away with him, apparently thinking he can fool her forever into thinking he’s the real thing. But to do this, he’ll need money, so he consults his handy-dandy newspaper clippings again to go and confront mob boss Penell in the guise of Virgil Sterig, a man Penell killed for cash. This isn’t a bad scene, by any means, but the Maggie and Foster scene was so much better that it’s easy to find this a little less enticing. It ends well enough—with Arch-as-Sterig’s assertion that he’s a ghost tipping off Penell that something’s up—but the ensuing chase through the nearby alleyway sets up the episode’s most difficult to swallow conceit. The Twilight Zone often hinges on ironic coincidence, so it seems churlish to complain about the ironic coincidence here, but Serling’s script tries to make too much of the fact that the man Arch assumes the identity of to escape the mobsters—a boxer named Andy Marshak—just happens to be the son of the newsstand operator he bumps into outside the alleyway. I suppose it makes sense that both Andy and his father occupy the same city, but since Andy’s apparently a famous boxer, the whole thing becomes slightly harder to swallow. Plus, he bumps into Andy’s dad straight off, and Andy’s dad immediately launches into his criticisms of what Andy’s done to his family. This is attempting to do something as emotional as the Maggie scene—only with the flipside of that excitement at seeing someone long thought lost—but it’s just too rushed. By the time Arch is being dragged down to the station by a cop (who apparently has a key to his hotel room) and re-assumes the identity of Marshak, only to have Marshak’s father shoot him, then stand and watching him rapidly shift through his assorted identities, everything is just too crowded. Any one of these four stories could have worked as an episode of television. In fact, it’s easy to see the story of a man who can change his face evading the police, or the story of a woman running off with her dead lover, or the story of the ghost of a mobster exacting his revenge ending up as the basis for a really great Twilight Zone episode. (It’s harder to see the story of a father and his disappointment of a son being unable to reconnect working as an episode of the show, but, hey, Serling loved boxing, so who knows?) But by forcing all four of them into the same episode, Serling’s script ends up shortchanging all of them, and the fix required to make them all work together wouldn’t have been a terribly difficult one to make. This isn’t a terrible episode, by any means, but it is a deeply disappointing one. What a twist! : There isn’t much of a twist in this one. The closest thing that qualifies is the moment when Arch—having just assumed the identity of a boxer—runs into that boxer’s angry, discontented father outside of an alleyway. Said father will later gun Arch-as-boxer down. It’s still surprising to me that the series aired new episodes on Christmas and New Year’s night in its first season. Television hadn’t yet gotten in the habit of taking a two-to-three-week holiday break. George Clayton Johnson, who wrote the story that this episode was the basis for, would write several other Twilight Zone teleplays and stories for those teleplays, his most famous probably being “Kick The Can.” His other work includes an episode of Star Trek and co-writing the novel Logan’s Run. I wonder what it’s like to live knowing you could die at any moment. But there’s so much more to this episode than its—justifiably famous—twist. In particular, I was impressed with how exciting this all still is. Early on, we’re let in on the fact that our hero, Sturka, who works in some sort of weapons plant, knows that the end is coming, probably within 48 hours. What’s more, the people he works with seem vaguely happy about this notion and the idea that the war to end all wars is finally upon them. (As Sturka talks with a friend about what will happen, the friend all too cheerfully suggests that, yeah, once the other nation discovers that Sturka’s nation has launched an arsenal, that other nation will respond in kind, but he doesn’t seem at all upset by how he’ll almost certainly die in that attack.) So there’s a ticking clock right away, and it’s one that can’t be avoided. But Sturka and his friend Jerry have a plan, and the episode lets us in on that plan early enough to give us both a sense of where all of this is heading and a sense of how easily it could all go wrong. By stealing the experimental aircraft Jerry flew, the two will spirit their wives and Sturka’s teenage daughter Jody (who’s bummed about having to break a date until she finds out she’s exiting the planet, something she accepts with a weird enthusiasm) to a world Jerry has found that’s just 11 million miles away. (It’s likely the script, again by Serling, this time from a story by Richard Matheson, means “11 million light years,” since “11 million miles” wouldn’t get you to Venus or Mars from Earth.) All of this is straightforward enough, but what makes these moments play is the paranoia Sturka expresses. Without ever coming out and saying it, the script heavily implies that the two live in a society marked by constant surveillance, a society where they need to contrive a reason to get to Sturka’s workshop and turn on loud machinery to talk about their plan. But there are other hints here that we’re not where we expect to be. The odd design of the telephone indicates that we’re in what was thought to be a vague kind of future in 1959 (when this episode was produced). The way that Sturka has to wear his “employee” button with its dehumanizing number on it suggests we’re in a totalitarian society straight out of Orwell, a society where men are reduced to numbers. And the way that Carling, a fellow employee of Sturka’s, is always floating around on the periphery of the story, just waiting to bust everybody, suggests a world where security has taken precedence above all else, where if a planet is going to die, dammit, everybody’s going to die with it. But that specter of imminent death is there, and the entire episode is suffused with the sense that all of these people will die over something we never even hear the reasoning for. 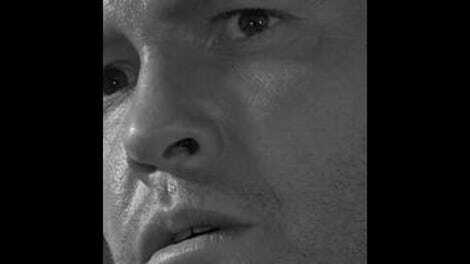 Serling’s suggestion is that no matter how good the reason Sturka’s nation has for punishing that other nation, it’s not good enough to kill every single person on the planet. And while he’s not subtle in making the connection between Sturka’s planet and our planet, he’s remarkably subtle in how he builds this argument in the first place. We never hear any arguments about politics or arguments about what must be done. Instead, we see a man who watches everybody going to the executioner with a happy smile on their faces and a tune on their lips and decides that’s not for him or his family. We all want to cheat death, the episode suggests, so why are we so hell-bent on preserving this system that could wipe us all from the planet in seconds? When push comes to shove, the thought of killing Carling isn’t even considered; when he almost keeps them from getting to the spacecraft, they finally do succumb to this urge, but the episode’s message is clear: Life is preferable to death. And as we now live in a world where that nuclear war between two superpowers was, ultimately, prevented, it’s telling to look back at TV shows like this and remember just how much people really did worry about everything ending in the blink of an eye, lest we be doomed to repeat that terror. What a twist: The planet that Jerry has found for the two families to make their new home on? Why, it’s none other than Earth, and the planet this whole thing took place on is… some other planet, 11 million miles away. I really do want one of those telephones. I strongly suspect that the two families don’t kill Carling because that’s just not the sort of thing you could do on network TV in 1960, but it’s still interesting that the idea isn’t even broached. (If Alfred Hitchcock Presents had done an episode like this, you know somebody would have suggested it.) Still, they get rid of the guy in the end. If there’s something I don’t quite like about this episode, it’s the way that everybody just seems so happy to be on their way to the grave. I suspect Serling is making a point here about how pointless all of this is, but it surprises me that Sturka and Jerry are the only people who’ve thought of taking the spacecraft up and away from this mess. That card game sequence is just marvelously tense. I like the way the camera pans around the table to a new close-up of each player, suggesting just how much they know is on the line. I also like the way that Jody just kind of hangs around in the background, obviously wondering what the hell is going on. The episode title gives the twist away for we modern viewers watching the episode on Netflix or on DVD, but it’s worth remembering that people watching this episode in 1960 likely wouldn’t have known the episode title. I suspect Richard Matheson needs no further introduction, as he's one of the best science fiction and horror writers who ever lived, to my mind. If you like that sort of thing, definitely check him out. Wikipedia says that a music cue that would later be used in the Mission: Impossible opening credits is used in this episode, but I couldn't pick it out.